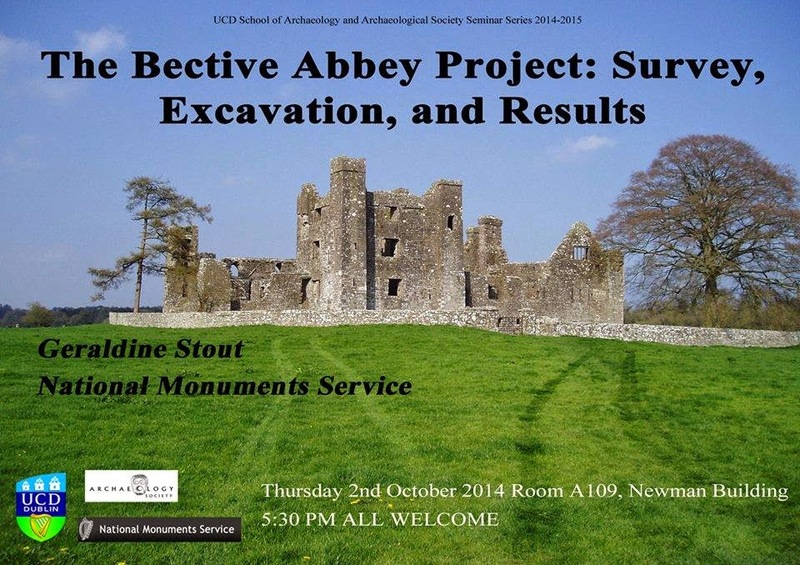 UCD Archaeological Society : Seminars 2014/15 report: "The Bective Abbey project: Survey, excavation and results"
Seminars 2014/15 report: "The Bective Abbey project: Survey, excavation and results"
It was a great pleasure to have Geraldine Stout of the National Monuments Service present some of the results of her research on Bective Abbey, located on the river Boyne, County Meath. This focused on not only the Medieval Cistercian abbey itself, but took a broader survey of the landscape: looking at not only the social and economic activity of the abbey itself, but also the granges that the religious order owned and that were worked by the order. There was a particular focus on the lower, lay order of monks who conducted the general labour within the Abbey. These monks are believed to have paved the way for future agricultural developments in Ireland, such as the implementation of crop rotation systems, as well as having a lasting influence on the later development of Medieval Manor houses. Using topographical and geophysical survey results, the decision was made to excavate in three main locations. In the lay brothers range, excavations uncovered a pit and hearth that are thought to have been the dining area for the lay monks, as well uncovering a rich assemblage of ceramic, metal and bone artifacts. Excavations were also conducted in an area initially though to have been a Cistercian barn. However, due to the discovery of masonry pads which are believed to have been used to support a raised floor, this is now believed to have actually been used as a granary; the discovery of ploughing tools also suggesting it may haved served an additional role as a storage space for farming equipment. Trenches were also dug in the Cistercian garden; this was found to be enclosed by a bank and ditch, the centre of which had several spade dug furrows. These furrows contained not only charcoal but also other household waste, which is believed to have been deposited in the furrows for composting. From this a rich assemblage of food remains has been analysed, including many different types of meats and seafood, such as Cod, Haddock, as well as shellfish and oysters. Analysis of these organic remains shows that the monks had a highly varied diet, with a rich variety of foods to choose from. Economic activity cannot be analysed in isolation, and what I really enjoyed was how some of the most thorough environmental research ever conducted on Medieval Ireland – in total looking at around 47,000 archaeological plant remains – was combined with a broad analysis of both the Abbey and outer grange to deliver a snapshot of what Cistercian Abbey life was like. It was surprising to learn just how well off the monks would have been: enjoying a diet with a wide variety of grains, meat and seafood, as well as how involved the Abbey was in managing their landscape: both through the cultivation of a wide array of crops, as well as the raising of domestic animals, such as rearing lambs. There was a real excitement from the audience, as many of them had been personally involved in the project. Both myself and the UCD archaeological society would like to wish Ms Stout all the best in her future endeavours, and would like to thank her for taking the time to present her findings.